Money Show Presentation by Peter Schiff! The best presentation at this year’s Money Show, May 14-16, Las Vegas, was that of Peter Schiff. His one hour presentation (today) was comprehensive and convincing. Peter speaks truth to power and this is why many will not allow his voice to be heard on any of our official media platforms. Bloomberg, for example, will not allow Peter to give his view on our financial situation. The media does not want to hear voices which reveal that all is not well with America, banking, politics, and economics. I commend Peter for his commitment to truth and reality! Peter laid out the history of our monetary policies since the 1960’s. He covered the reasons why our money has no tie to gold and/or anything tangible. He says that our bankers have created a policy situation which can not be corrected with more money creation or more QE. Essentially, America is bankrupt and the coming financial collapse will be much worse than 2008. He envisions higher interest rates, then a serious correction/collapse, then high inflation (possibly hyper-inflation) as the Fed attempts to lower rates and reflate the markets. All these policy prescriptions will not work as our policy options are now not relevant for the hyper distorted markets which have emerged. Peter sees a new round of QE (eventually) and a Fed balance sheet of double or triple its current level. Prior to this new QE, he sees crashing real estate markets, bond markets, and most global stock markets. The dollar will weaken as foreigners exchange all their unwanted reserves for American hard assets. Prices could hyper-inflate as foreign dollars come after hard/tangible assets. Gold will double, triple, and other assets will get either hyper-inflated or hyper-deflated (all depending upon what the Fed does as the markets crash and burn). All this could happen in 2018 and 2019 as confidence wanes and our markets crash. Peter claims there is no solution to our financial cook books. The deficits will get much greater, the debts will become unpayable, and the citizens will become members of a banana republic. He is convinced that nothing can solve the current problems given that all is now beyond the Fed’s capability of resolving. Past policies have set the agenda for this dire scenario. Basically, the cards have been played and America is a huge loser as Humpty Dumpty comes crashing down. All this is absolutely assured, says Peter, as all viable options have already been played. He loves America but not the current American policy agenda. Peter gave a very convincing presentation to those who understand reality. I commend him for his honesty and spontaneity. 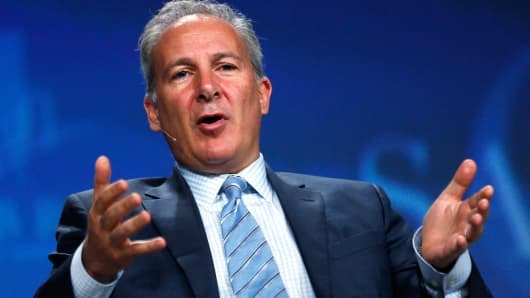 We need more Peter Schiff’s in this country of ours. Those who listened to Peter (some 200 or so) will likely agree with this paraphrase. Think for yourself. I am: https://kingdomecon.wordpress.com. ← Money Show, Las Vegas, the Message!